About Pete’s Tire Barns: Pete’s Tire Barns, Inc, headquartered in Orange, MA, has grown to one of the largest independent commercial tire dealerships in the country. Pete’s currently operates 19 full-service locations in New England, a brand new state-of-the art Distribution Center, and 2 Bandag retread facilities. The company employs in excess of 200 people, and operates a fleet of over 100 service and delivery vehicles. In 2013, Pete’s Tire Barns celebrated their 45th year in business and has consistently been recognized by both Modern Tire Dealer and Tire Business magazines as a leader in the industry. 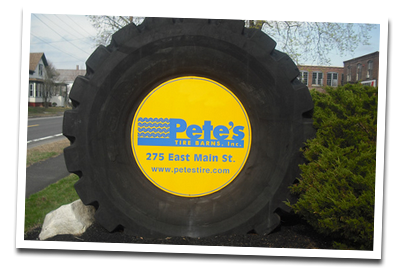 Pete’s Tire Barns sells and services tires for a wide variety of vehicles and equipment. Our motto is Tires for Work, Tires for Play and we have tires to fit everything from the a small moving dolly up to a huge earth-mover tire. We have experience, tools and technicians to service all sizes and kinds of tires. With tires for Passenger Car, Light Truck, SUV, Commercial Truck, Farm, Forestry, OTR, Industrial, Lawn and Garden, Trailer, ATV, Golf Cart and more.